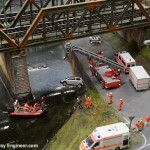 Keeping a model railway layout dust and debris free during construction is a pain. 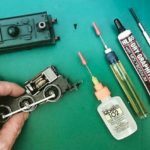 Here’s how I keep mine clean without damaging the delicate parts of the layout. 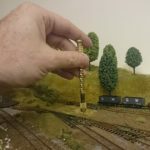 I’ve been doing a lot of work on my railway recently. Specifically, landscaping: carving streams and rivers into the baseboard, cutting polystyrene hills and scraping out dips in the landscape to match the terrain I’m modelling. 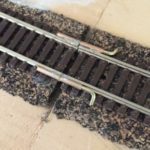 This along with ballasting and applying static grass has created a mess around the layout. More troublingly, this work creates dust that creeps in to track and point work no matter how much masking tape I used. 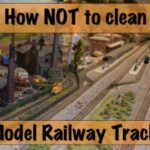 Historically, I’ve used a variety of brushes and dustpan to sweep modelling debris away but faced with so much crap around the layout and with more to come I went in search of a better solution. I know others including the world’s largest model railway, Miniature Wunderland, use vacuum cleaners to maintain their layout so I first tried our normal household hoover but a DIY nozzle I knocked up. It was a bit Heath Robinson but I hoped it would serve my purpose. One of the existing attachments was heated over a flame and then gently squeezed when it became malleable. This gave a flat narrow flat opening. Nex,t I glued the mesh from a plastic colander over the opening and the bristles from an old floor brush to it. This created a narrow nozzle that could get into hard to fit places, with brushes to dislodge determined detritus while the mesh would prevent anything important on my layout disappearing into the hover bag. Sadly, while the nozzle worked a treat the hoover was too powerful and pulled up a lot of ballast. It was also a bit bulky and noisy and not suited to late night use when I tend to do much of my modelling. I also tried a commonly suggested tip, of wrapping a sock over the hoover tube. This worked well for a while but the sock quickly became blocked up meaning it could only be used for short periods before needing to be cleaned and more frustratingly the power of the suction dislodged too much scatter and fine detail. I wanted to remove the excess that hadn’t not all of the scatter! Next, I tried one of those little car vacuum cleaners. Annoying, it used the car charging point as a power supply so before I could even try it I had to hook up a 12v power supply. More irritating however was power the lead then draped across the layout and had the potential to wreak damage to existing scenery. Trees and buildings seemed especially vulnerable. The biggest issue however was that it just didn’t have enough suction power. Even though I was only sucking up small particles it left much behind. Extra Tip: If you use a hoover to tidy up after ballasting / scatter laying you can waste a lot of the material. To conserve material place a sock into the tube but with the opening wrapped over the end of the nozzle. Then when you’ve finished vacuuming pull the sock out from inside the nozzle, sieve the contents and you’ll save the scatter or ballast for another day. In-the-end, I found this mini-household vacuum cleaner. It’s rechargeable battery driven so there’s no lead to snag on scenery but still has enough sucking power — 3Kpa — to pick up most rubbish found on a layout. 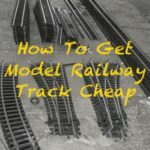 It certainly handles ballast, card, the odd track pin and bits of wire that end up scattered around a layout without problem. 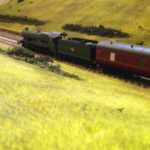 It’s also got a variety of attachments, including a brush nozzle to get into hard to reach places, and so doesn’t suffer from the problem a lot of hand-held vacuum cleaners have with the suction hole being too large for the confined spots on a layout. The only issue I’ve found so far is that I can figure out how to easily slide the flexible extension tube into the main suction hole and I had to force/squeeze it in but I’m probably missing something. Finally, the container unit is transparent so I can easily check if its consumed something that it shouldn’t. I particularly like this as, with N and 009/HOe gauges in particular, it’s all too easy to not see something until it’s too late. I’ve lost more than a few couplers this way. Overall, I’m really pleased with this particular hoover and it has made maintaining and cleaning my layout much easier and without the problems I’ve had with other cleaners. Now the only problem is I’m being asked to do more hoovering around the house. Ah well, the life of train modeller.